Xiantao Dream Village, the most characteristic of Chinese culture, recruits the most popular village heads and island owners around the world. February 28, 2019 — Xiantao Dream Village, the most characteristic of Chinese culture, recruits the most popular village heads and island owners around the world. On February 28, the Global Promotion Conference of Mango City & Xiantao Dream Village Cultural Travel Union was held in Hunan Broadcasting System, Changsha City in central China, with the theme of I am the most popular around the world . This activity was jointly organized by China's TV innovation pioneer, Hunan TV Urban Channel, integrating the media ecology of Hunan Mango System, joins hands with the world's high-quality cultural tourism attractions, builds the Mango Metropolitan Cultural Travel Promotion Alliance, to plan a series of thematic activities of I am the most popular around the world for the first time. It promotes the first cultural tourism area in China s Jianghan Plain, the Dream Village of Xiantao City, Hubei Province, globally and hopes the high-quality tourism become the basic way for people to live a better life. The I am the most popular around the world event in Xiantao Dream Village will focus on "Xiantao Taste and Village Heads Appointment". 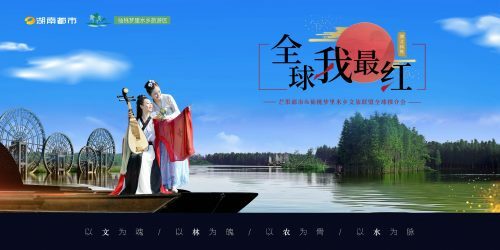 Through the "the World's Most Popular Village Head (the Most Popular Island Owner) Selection Competition", "the World's Most Popular Fish King Banquet -Two Lakes Live Broadcast", "I am the Most Popular in the Year-Village Head Forum for the 70th Anniversary of the Founding of the People's Republic", the public will experience the unique Jianghan folk culture people and picturesque dream village life. To this end, Li Rui, the star villager of China's most famous variety show Where Are We Going, Dad? , also came to the platform to help promotion. He jointly launched the "Golden Key" campaign with the leaders of Xiantao Municipal Government, Hunan TV Urban Channel and scenic spots, officially opened the "the World's Most Popular Village Mayor" competition, and extended a cordial invitation to the global public to come out of the fairyland Dream Village to be the world's most popular village heads. In particular, it is worth mentioning that on April 28, the world's most popular Fish King Banquet will be live-broadcast on television to come on stage. At that time, the world's famous chefs will bring a variety of fish cook and the world's first steam fish of 100 jin will also be steamed on the scene. Thousands of tourists from all over the world will have a good taste. It is understood that the Dream Village Tourism Complex in Xiantao City, Hubei Province, covers an area of more than 5,000 mu. It relies on the original 10,000 mu water forest of Zhaoxiyuan Forest Farm in Xiantao City, takes culture as its soul, forest as its spirit, agriculture as its bone and water as its vein, highlighting the water culture of the plain with homesickness as its theme, and reproducing the traditional scenes of rural life. The scenic spot covers 10 characteristic functional blocks such as lotus pond village, rural wetland, flower and wild luxury resort camp, etc., as well as has 12 tourism highlights such as water forest, steaming, forest health spa and so on, which is a breakthrough for Jianghan plain tourism. It is reported that the first China Country Music Festival will be held in the second half of the year to continuously improve the cultural quality of the scenic spots, enrich the cultural experience of tourists, and gradually build an international standard tourism complex.